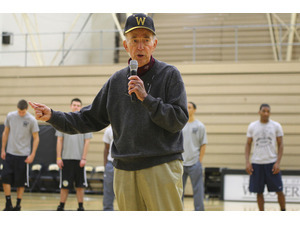 WOOSTER — College of Wooster legend Al Van Wie died Wednesday morning at age 85, leaving a legacy that extended well beyond the basketball court where he made his name as a coaching great. The Fighting Scot alum compiled a 302-216 record as the men’s basketball coach from 1961-82 and was the athletic director from 1974 until retiring from Wooster in 1991. He played a major role in advancing women’s athletics and in helping form the North Coast Athletic Conference. Nicknamed the “Dutchman,” Van Wie directed the Scots to three NCAA Tournament appearances, including their first trip to the “Sweet 16” in 1977-78 and one Ohio Athletic Conference Tournament title. One of Van Wie’s best moves was hiring current Wooster basketball coach Steve Moore, who owns a 595-134 record over the past 25 season directing the Scots. Moore described Van Wie as much more than just a basketball coach who’s in four different halls of fame. “It’s very sad news,” Moore said. “Coach Van Wie is going to be missed, not only by people at The College of Wooster, but so many in the community. Van Wie was an early proponent for advancing women’s opportunities in athletics and just Tuesday night attended the Triway volleyball team’s win over visiting Manchester, said Titans coach/College of Wooster Director of Public Information John Finn. Moore called Van Wie “an innovator who was often ahead of the times in the way he coached and thought,” and said he founded the first basketball camp for middle school and high school players in Ohio in 1970. Today, “Camp Fighting Scot” is still regarded as one of the best camps in the country for kids to learn about basketball fundamentals and sportsmanship. Van Wie founded the Mose Hole Classic in the early 1960s, which is now one of the oldest holiday tournaments in the country. He established the Downtown Rebounders Club in 1969 in partnership with local business leaders, which is still popular today. “Coaching camps and a community club for a Div. III basketball team were unheard of in those days,” Moore said. Van Wie found time in the spring from 1962-75 to coach the Scots tennis teams to a 101-50 record. Many of the basketball players Van Wie coached went into the profession themselves, including Larry Shyatt, who’s currently the head coach at Wyoming, and Reggie Minton, who coached the Air Force Academy from 1985-2000 and is now the deputy executive director of the NABC (National Association of Basketball Coaches). Former Van Wie assistant Dave Grube, also a member of the WCSHOF, went on to be the head coach at Kent State and Central Michigan. “I’ll remember Coach Van Wie as truly a beacon in my life,” said Minton, who played for the Scots from 1960-63. “When I was at Wooster, he was much more than a coach and a mentor. Despite having played for Van Wie five decades ago, Minton said he still talked to his former coach once a week. Tom Dinger, a retired Wooster High School teacher, is the Fighting Scots’ all-time leading scorer with 2,370 points from 1968-71 and still recalls his first meeting ever with Van Wie. Many years later after Dinger had a major health scare in November, 2011, he was hospitalized in the Cleveland Clinic and was unconscious for 21⁄2 weeks. “The first person I saw upon awakening was my wife, Pat,” Dinger said. “And the second person I saw was Coach. Among the many civic groups Van Wie was involved with was the Wooster Rotary, which he once served as its president. In his final years, he was passionate about leading food drives to benefit People to People Ministries in conjunction with annual basketball clinics he organized and The College of Wooster’s Al Van Wie/Wooster Rotary Classic that’s named in his honor. This year’s 19th annual Van Wie/Wooster Classic will be held Nov. 22-23, with Baldwin-Wallace among the teams that will come to Wooster. A native of Schenectady, N.Y., Van Wie’s father died when he was four years old and he was raised by his mother during the Great Depression. He joined the Navy for two years after high school and then enrolled at The COW in 1952, where he met his future wife, Judy (Tilford), who survives. He left Wooster for a variety of coaching jobs in Ohio and Michigan over an eight-year period, but returned to the Scots in 1960 as an assistant coach in football, basketball and track. He succeeded Jim Ewers as the head basketball coach in 1961, and held that job for the next 21 years. A member of the Wayne County and College of Wooster Halls of Fame, Van Wie was passionate about trying to teach young people life lessons along with how to win. “There must be educational value in athletics,” he told COW News Services several years ago after being named a Distinguished Alum. “If not, it shouldn’t be on campus. Van Wie is survived by his wife, Judy; brother Richard (June) of Duanesburg, N.Y.; sons Michael (Liz) of Atlanta, Ga., Paul (Anne Marie) of Jacksonville, Fla.; and daughters Janice (Chris) Adams of Lima, and Jackie (Stacey) Teny-Miller of Columbus. McIntire, Bradham and Sleek Funeral Home in Wooster is assisting the family with arrangements. A celebration of life service will be held in McGaw Chapel with a reception to follow in Timken Gymnasium on a yet-to-be-determined date. Memorial contributions can be made to the Wayne County Committee for Crippled Children and Adults, the Village Network or The College of Wooster’s “W” Association. I enjoyed working with him and his JV team in 1960 at COW. One game is big shoot shooter fouled out with 4 minutes to go in the first half which even surprised me, the ref. When Tracy got near the bench AL said: what are you doing? Coach I just fouled out! You did How did that happen? When I cam to campus in summer of 1995 to see my friend Byron Morris who was housebound, my son and I went down to the new SZU. There was AL. I reminded him of the above. He told me THAT was the biggest shock of his coaching career!